Today’s the day that I take a look at science fiction and tell you there is no such thing as a free lunch (TINSTAAFL Tuesday). If you’ve read anything new recently, there is a good chance there’s a utopian/dystopian society involved. Dystopias have a great deal to teach us about human behavior. This week’s novel was written by William F. Nolan and George Clayton Johnson in 1967: Logan’s Run. That’s a little before my time, but the movie was made in 1976 and made an impression on my young mind. Since most people stare at me blankly when I mention it, I’m giving it some attention today. Michael York (Logan) and Jenny Agutter (Jessica) starred. Farrah Fawcett had a role (the poster shows her rather prominently). In the 23rd Century, a computer controls all living conditions and resources in a domed city that protects the inhabitants from the destroyed world outside. The citizens do whatever they want and live decadently, because they don’t have to work or worry about anything (or wear much clothing, either). Sounds boring… But wait, there’s a price. There is no such thing as a free lunch. The price is that no one can live beyond the age of 30. Each person has a life crystal, which indicates age by color, embedded one hand. When it goes dark, he or she must be culled in the ritualistic killing called the Carrousel with the promise of rebirth. I remember this scene more than any others in the movie. Those who don’t want to die this horrible death escape beyond the dome. Logan is a skilled Sandman (police assassin), who prevents Runners from escaping to find the mythical Sanctuary. The computer gives him into an undercover operation. His life crystal goes dark four years early to force him to find and destroy Sanctuary. He escapes and meets Jessica, who is also on the run. I won’t give away the endings. The novel and the movie have differences. Read the summaries on Wikipedia (which also explains the novel that I must now read) and iMDb. One of the things I love about science fiction is that it presents a problem (dark, twisted, and scary sometimes) to make us think for ourselves and to live. At lunch yesterday, a friend mentioned a country that rules in such a manner that the people don’t know that life beyond their land is different–they’ve been told the outside world is dangerous. They believe the government will take care of them even while many of them live in conditions that we would find unlivable. People are hunted down who try to escape. Since this is not a political blog, that’s as far as I’ll go. You get the picture. The similarities were startling to me, perhaps because I’d already written the draft for this post about Logan’s Run. Digging deeper, the conversation made me think about what Logan’s Run can teach us about our own lives. Have we already grown complacent about certain things? Now it’s your turn. 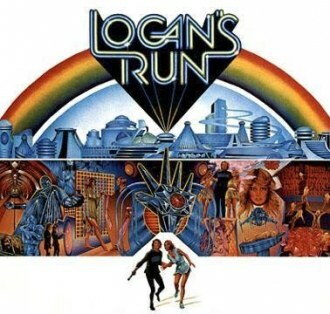 Did you see Logan’s Run the movie or read the novel? What do you think about the story? What happens when we rely too heavily on technology to keep us safe? Who gets to say at what age a person is no longer viable to society?